What follows are not exactly recommendations; they're just places that I like enough to visit repeatedly. My choices reflect my taste and my budget, and also my locale. I stay in the Siam Square area when I go to Bangkok, and I only go to places that I can reach easily from there, i.e. by BTS, MRT, or canal boat. Got that? OK, let's start with the more economical end of the scale. Apart from sidewalk food stalls, the cheapest places to eat in Thailand's capital are the food centres, which are Bangkok's answer to Singapore's hawker centres. Unlike sidewalk operations, they have the advantage of being air-conditioned. They're easy to find since every shopping centre has one, and often even the larger chain supermarkets, for instance Tops, have them. Now that I think of it, even some office towers have one in the basement. They operate on a coupon system. First, you go to the booth and buy coupons in different denominations, which you use to pay for your food. I usually buy 100THB worth of coupons, which is more than enough to pay for a plate of food and a drink. If you have coupons left over when you finish, you take them back to the booth to re-convert them to cash. 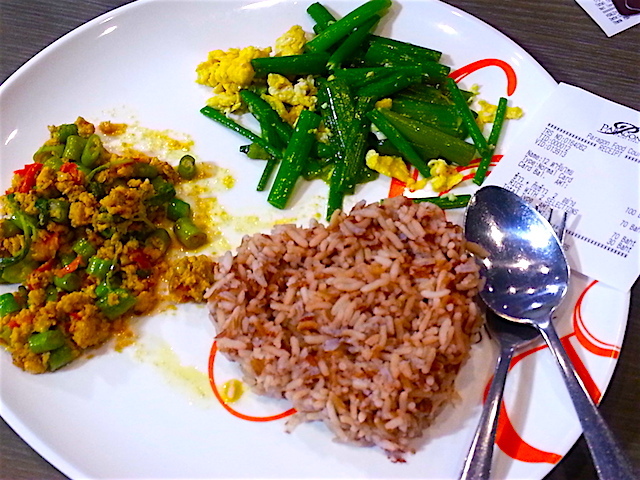 The plate pictured below, with steamed rice, stir-fried basil and chicken, and stir-fried greens, along with a bottle of water, came to 70THB ($2.24USD at the current exchange rate). This was at the food centre in Siam Paragon in Siam Square. My favourite of all Bangkok food centres is the one at MBK, which is on the edge of Siam Square and linked to the National Stadium BTS station. Beware, though: there are 2 food centres inside MBK, on different floors; one is called The Avenue (I think? ), and is quite pricey because it features a lot of international stalls run by outside restaurants; you want the other one, which is on the floor above, and consists mostly of small vendors selling mainly Thai favourites. Note: The plate was huge, almost a platter, so the portions are actually more substantial than they may look in the photo. You can also ask for a fried egg to be put on the rice. I don't usually stay at historic, high-end hotels unless an employer or client is paying. However, I do like to treat myself to afternoon tea or a cocktail in such places, for instance at the Raffles in Singapore, the Strand in Yangon, and the Oriental in Bangkok. 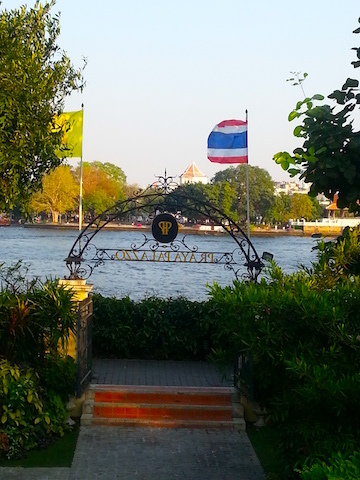 A (fairly) recent addition to the list of visitable historic hostelries in Bangkok is Praya Palazzo, a beautifully restored 19th-century villa on the Thonburi side of the Chao Phraya River. If you book ahead, they'll send a motor launch to the Bangkok side to pick you up and take you back. Pictured below is the river view from the Praya Palazzo terrace. The tea set (I always substitute coffee) at Praya Palazzo features an array of beautifully confected Thai sweets, many of them coconut-based, as well as some savoury treats. I didn't ask if you could swim, but you probably can. You're certainly welcome to wander the lovely, leafy premises. My friend and I posed for a photo with our spread (see below; I'm on the right). 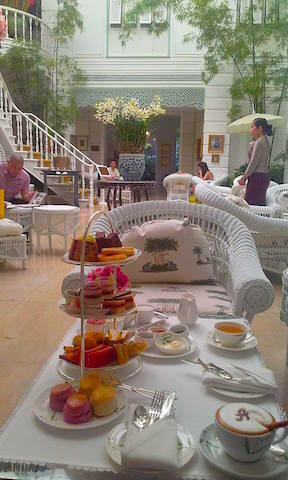 The most famous venue for afternoon tea in Bangkok is of course the above-mentioned, legendary Oriental Hotel. Properly speaking, the Oriental Hotel is now known as the Mandarin Oriental Bangkok. I've never stayed there, but I have partaken of afternoon tea in the Author's Lounge. This space, pictured below, is the glassed-over courtyard of the original 19th century hotel building. It's named for the many famous scribes who have stayed at the Oriental down the decades. The tea set (you can substitute coffee, which I did) is lavish and delicious, but there's more to the experience than just the comestibles. Apart from enjoying the atmosphere, you can also make use of the library. If you book for a Tuesday afternoon, there's also a guided tour of this most historic part of the hotel, and you get a commemorative book to take home with you. If any of the authors' suites are vacant, the guide might let you take a peek inside. The legendary writers who have suites in this wing named after them include Somerset Maugham, Noël Coward, and Gore Vidal. The suites are up the staircase that you can see in the above. My favourite Bangkok neighbourhood to dine in is Chinatown, also known as Yaowarat, and my favourite eatery there is Hua Seng Hong Restaurant. It's right on the Yaowarat Road main drag. The entrance is pictured below. 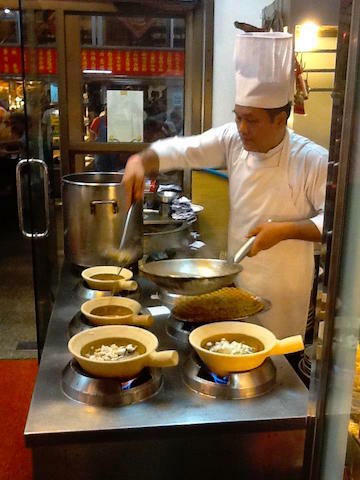 One of the unique features of Hua Seng Hong is that the kitchen is at the front, and you walk past the chefs in action on your way into the dining room. I've read some gripes about it on Trip Advisor, but my advice is to ignore them. 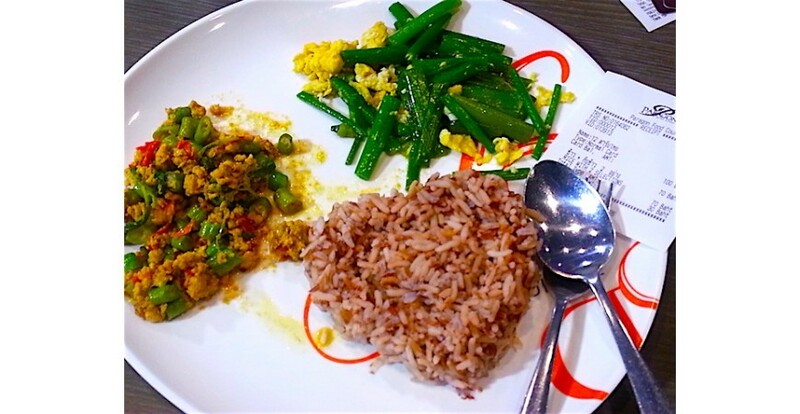 Hua Seng Hong is on the tourist trail, but the locals patronize it en masse, too, and you can't fool the Thai-Chinese when it comes to Thai-Chinese food. 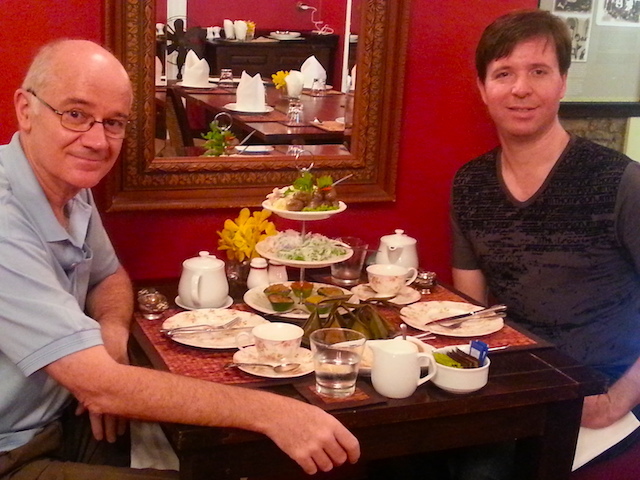 For me, no visit to Bangkok is complete without a meal here, for which I usually gather a group of friends. This is what we usually order: 1. a steamed fish -- order it first because it'll take the longest to prepare; the most on the ball servers know to dash off immediately to place the order and then come back to take down the rest of your selections; 2. a plate of roast duck; 3. grilled shrimp; 4. a veggie dish of some kind chosen from the extensive list; 5. crab fried rice. A half-eaten sampling of these dishes is shown below. For appetizers, we just choose a few items from the dim sum cart that comes around. I customarily wash it all down with a bottle of the affordably priced Qingdao beer. 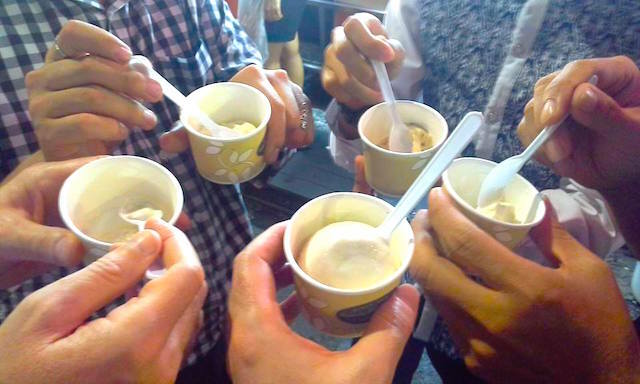 Although there are traditional desserts on the menu, we forego them in favour of an ice cream from a vendor on Yaowarat road. It used to be a bit of a business getting into Chinatown from other parts of the city, but the new MRT extension should make it a lot easier. The Wat Mangkon station is probably only 5 minutes' walk from the restaurant. 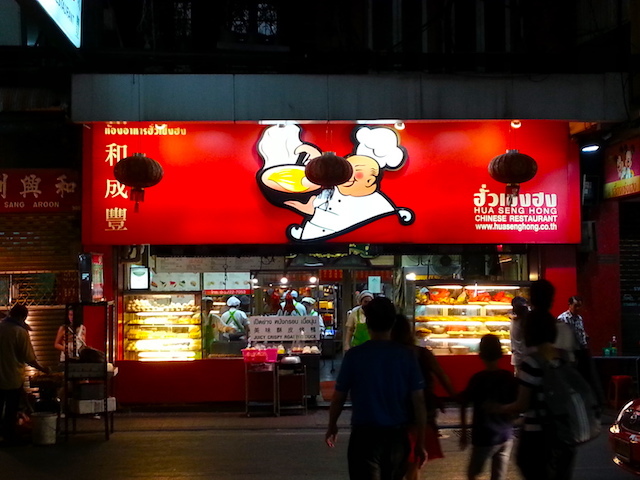 As mentioned, I usually skip dessert at the restaurant and head out onto Yaowarat Road. There are vendors that sell traditional Thai sweets, but I make a beeline for the ice cream vendor. As far as I know, it's the only ice cream cart on the same side of the street as the Yaowarat Hotel. The cart seemed to have changed hands a few years ago, but the ice cream is still good. My favourite flavour is coconut (see below). 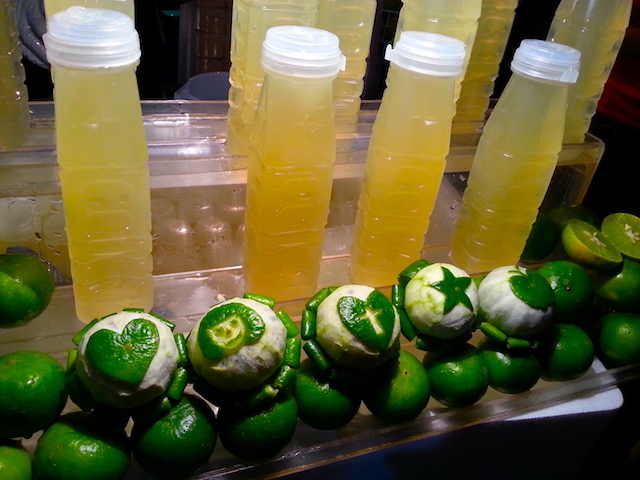 If it's juice you're looking for, there's a vendor who does wonderful tangy lime juice, and artfully displays the limes themselves. If you want something savoury, but not a whole meal, try the dim sum vendor. 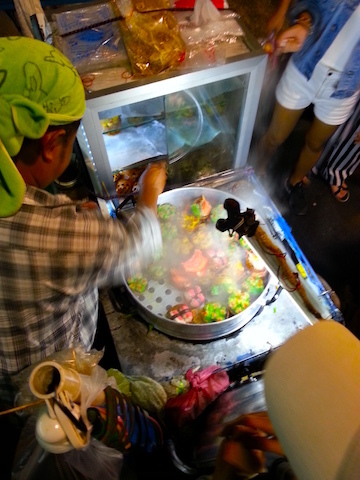 If you DO want a full meal, there's no shortage of vendors dishing out noodle- and rice-based dishes. They line almost the entire street from Odeon Circle to the Grand China Princess intersection. If you're there at a busy time, choosing a vendor will be easy -- pick the one that happens to have a table free! My home-away-from-home in Bangkok is the Reno Hotel in Soi Kasem San 1, near the National Stadium BTS station and MBK. Other than breakfast, I don't often eat there, though. Not that the food is bad, you understand, and in fact many local office workers come in for lunch, but there are so many cheap eats in the soi outside. For the occasional splurge, I head around the corner and down Rama I Road to the Siam at Siam Design Hotel Bangkok. I appreciate the funky, colourful decor that highlights the work of contemporary artists. There is a lunch buffet in the ground floor restaurant, Party House One, which I've always found to be good value for the mid-range price. I note that Siam at Siam Facebook page is currently advertising lunch for 600THB++. 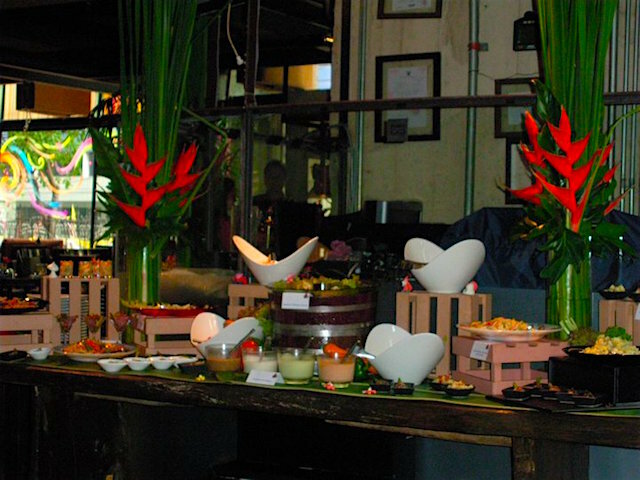 The Party House One buffet offers a diverse selection of Thai, American/international, and pan-Asian dishes, which is useful if you're with a mixed group. More usually, though, I head upstairs to Bar 11 at cocktail hour. It's on the 11th floor, natch, so there are stunning views towards Chinatown, and the cocktails are delicious. 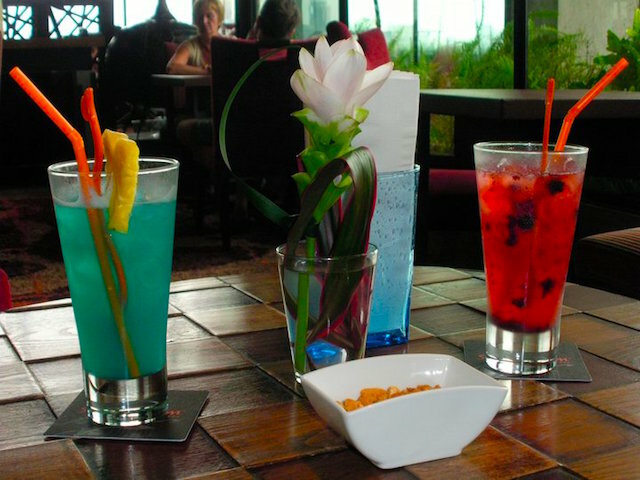 The highlight of the cocktail list is the extensive choice of martini variants, but neither of the concoctions in the photo above was a martini. I can't remember what they were. I suspect the turquoise one was a Kamikaze. There's also a new-ish rooftop barbecue restaurant atop the Siam at Siam, but it's a bit too pricey for my budget. So, there you have a run-down of some of my favourite places to eat and drink in the City of Angels. What are your favourites? Let me know in the comments below, on the Lotus & Persimmon Facebook page, or under an appropriate photo in our Instagram gallery (@lotusandpersimmon). Do your household spirits have a home? Saranrom Park is Old Bangkok's green lung. Highlights of the small but choice Thai collection at the Guimet Museum. 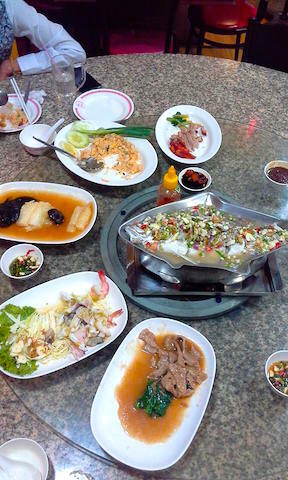 Away from Bangkok, good meals are to be had roadside, beachside, and riverside in Thailand's provinces. In Bangkok on a weekend? Don't miss Jatujak Market. Click for L&P's highlights of the world's largest weekend market. The north of Thailand, AKA Lanna, has a cuisine all its own. Click to read about eating in in the northern capital. L&P follows a young muay thai boxer through fight night at the former Lumpinee Stadium in Bangkok. L&P bids farewell to legendary and prolific Bangkok author, William Warren (1930-2017). "Art and Artifacts from Asia"
Browse this site for beautiful items sourced from Bali to Bangkok to Busan. Be enchanted by the highlight of our collection: Buddhist revival art from Korea. Please signup for the Lotus and Persimmon newsletter.